We're very excited to be joining with Jacqueline Harvey for a special afternoon tea event to celebrate the launch of Alice-Miranda to the Rescue. 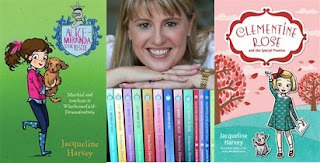 Young fans will enjoy a talk from Jacqueline and answers to their questions, some yummy treats and a drink. Dress up as your favourite character and win prizes for best in show! Clementine Rose fans can come along too and there's a new book for you to read, Clementine Rose and the Special Promise.